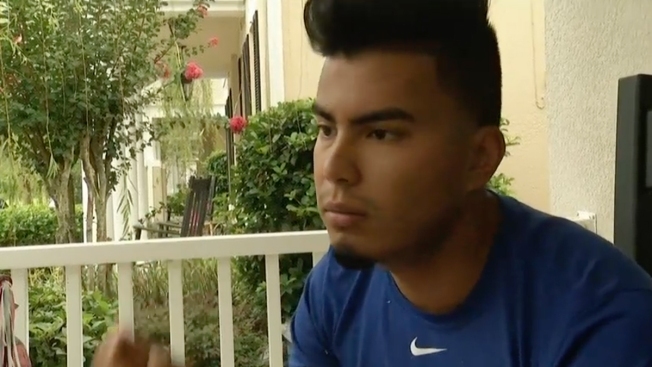 Luis Burbano had escaped from the bullets flying across the dance floor at the Pulse nightclub into a narrow alley and through a hole in a fence when he stopped to help a young man who collapsed in front of him. "I grabbed him not realizing that his forearm was split in two," Burbano told CNN. "Then I realized he had a gash on his side as well." Burbano quickly took off his shirt to use as a tourniquet and, as he talked to the young man to keep him calm, he realized another man was pacing back and forth. And that man had a bullet in his leg, he said. "I did a tourniquet really quick on him as well," said Burbano, an employee of Florida International University, according to his Facebook page. "I had them both by my side until the paramedics came." 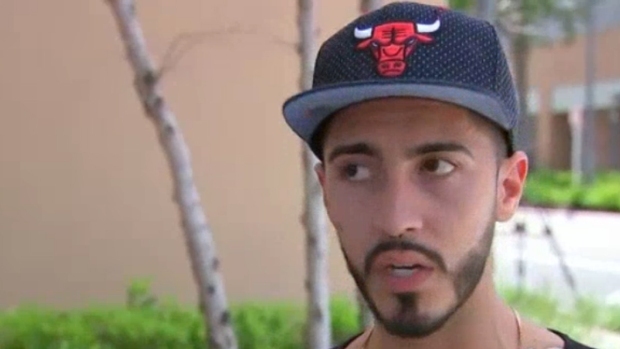 A clubgoer followed his instinct and left Pulse Nightclub in Orlando after he says he smelled ammunition. 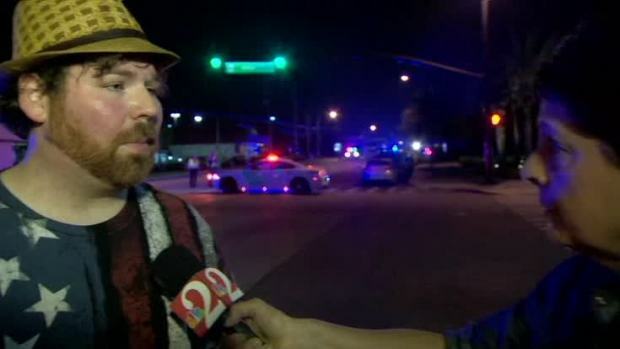 NBC10's George Spencer is in Orlando and spoke to the witness about what he saw. 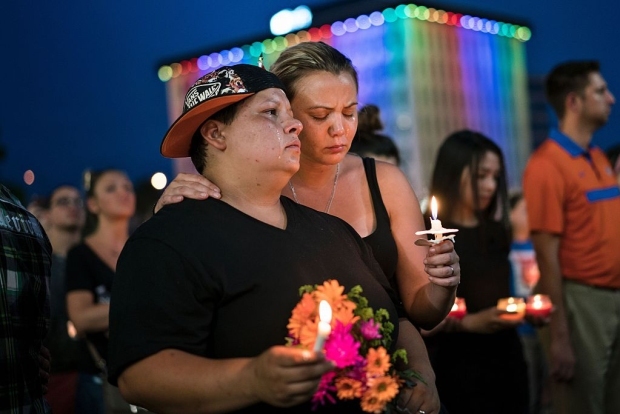 Stories of bravery like Burbano's are emerging from the terror in Orlando, Florida, that began inside the gay nightclub around 2 a.m. Sunday when 29-year-old Omar Mateen, armed with what authorities said was an assault rifle and a handgun, opened fire. At least 49 people were killed and dozens wounded by the time Mateen was killed by a SWAT team. His motive for attacking the club is still under investigation, authorities say. In a 911 call immediately before the slaughter, Mateen swore allegiance to Abu Bakr al-Baghdadi, the leader of ISIS. His father told NBC News that Mateen had been infuriated earlier when he saw two men kissing. Joshua McGill, a nursing student, wrote on his Facebook page that as he hid under a car with a man who had been shot, he tied shirts over the wounds to stop the bleeding. "[A]nd got him secretly to the nearest officer who then transported us to the ER," he wrote. "Words cannot and will not describe the feeling of that. Being covered in blood.. Trying to save a guy's life that I don't even know regardless that I'm fine..just traumatized." The man was later identified as Rodney Sumter, a bartender at Pulse who was struck in his arms and back. On Monday morning one of his cousins wrote to McGill to say that Sumter was in good spirits, waiting for surgery. "Thank you so much for saving his life," Trina Brown Linning wrote. "If you had not stopped to help him, he could have easily bled to death. God bless you and your family." Christopher Hansen describes what he did to help save someone's life. Christopher Hansen, a newcomer to Orlando, thought at first that the shooting was part of the music. "I looked over and I saw bodies falling, people screaming," he said. "The person next to me was shot and the blood splattered and then I fell down." When he got out of the club, he took off his bandanna for a man whose pant leg was drenched in blood, he told NBC News. A DJ at the club, Ray Rivera or DJ Infinite, mistook the shooting for firecrackers until he turned off the music, he told The Daily Beast. When club-goers began to scream and run, he ducked behind his DJ booth and was quickly joined by a man and a woman. The man made a run for it, but Rivera helped the woman escape. "I never imagined I would be at anything like this," he told The Daily Beast. "It was so terrible." Emilie Plesset contributed research for this article.